A beautifuy romantic combination of hot-foil and letterpress vintage design making a fine impression into an oyster, water colour board. 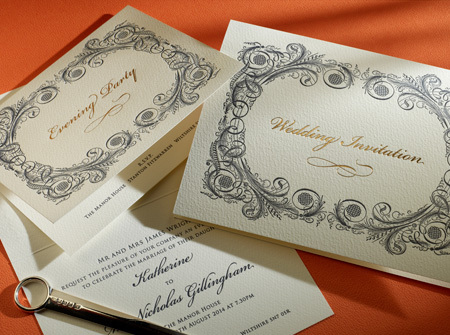 The textural effect of the invitation is instantly striking. The standard wedding invitation is printed letterpress in slate ink, with gold foil on a 8″ x 6″ Oyster impression fly card, slate ink inside, supplied with matching envelopes (unlined). I was wondering if you could please give me a rough price for approximately 40 Wedding Breakfast invitations and 80 Evening Invitations? I would like a price for the Baroque Vintage Wedding Invitation style with the centre writing in red.